This year has seen my switch from DBMM to Field of Glory and the plan I set out for 2010 in April is still on track. I’ve decide to write about my progress at the end of this month but in the meantime I thought you’d be interested in one of the recurring themes of my post game discussions: dice and probabilities. With DBx all combat dice are competitive; you must roll more than your opponent to win and ideally twice as much to remove an element. 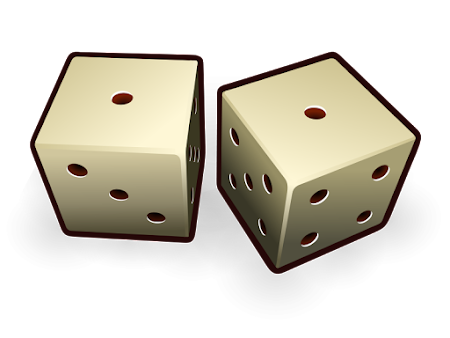 This means that the absolute score on the dice is important and 6-1, or 1-6, results are usually decisive. In contrast, Field of Glory uses a very different mechanism; a number of dice are rolled and all dice at and above a certain score count as hits. So rolling three 6s has exactly the same effect as rolling three 4s if you only need to score 4 or more. This difference has taken some time to sink in. The change has a physiological impact due to the temptation to assess the number of spots rather than the number of hits. Rolling three hits with 6s seems more extreme than rolling three hits with 4s. Of course this is rubbish but after years of playing DBMM it’s a hard habit to break. There’s also a tactical impact as assessing the probability of success for a move can be clouded by the mechanism. The penny finally dropped when I realised that needing a standard score of 4 or more on 1D6 is just a 50:50 chance or the same as tossing a coin. So each re-roll is worth a little over 8% if there are no points of advantage (POA) in play. Superior troops fighting with a commander have a 2:1 chance of scoring a hit compared to 1:1 for average troops without a commander. Average troops taking a cohesion test requiring 7 or more have nearly a 6:4 probability of passing compared to superior troops at 7:3 . It’s striking how sharply the probability of success fades as adverse circumstances combine to increase the score needed to pass the test. Both of these tables are useful in assessing the likelihood of a succeeding in combat and passing any subsequent cohesion test. They also quantify the value of superior and elite troops and the use of commanders to bolster troops in adverse circumstances. output 2d6 named "No rerolls"
output 2d [reroll d6 below 2] named "Rerolling 1s"
output 2d [reroll d6 below 3] named "Rerolling 2s - keeping highest"
output 2d [reroll d6 below 4] named "Rerolling 3s - keeping highest"
I will leave it to you to work out the effect of re-rolling 6s for poor troops in combat. Hint: you will need to either rewrite the function above or invert the probabilities for re-rolling ones in the spreadsheet. Have fun. Elsewhere, someone has successfully taken up the challenge of working out the effect on 1d6 of rerolling 6s for poor troops. So I've added a row to the probability tables.